SO YOU CAN GO PLAY! We hope you will take some time and look around the site. You'll find a lot of helpful information to help you succeed in making the transition to slow feeding. For your animal loving friends and family. You can now create your own account on HHN during the check out process. Then when you return you can sign in (on the site menu). This new option allows you to securely save payment methods, shipping addresses, shopping carts, and order information, making for a faster checkout experience. Better for digestion as it slows down the amount animals can consume PER MINUTE but is FREE CHOICE and prevents bloat and colic. Obese horses will eat less but still have access to food all day. Alleviates the boredom and STRESS that can lead to ulcers, colic in horses, bloat in ruminants AND stops wood chewing, manure eating, etc. Slow feeding regulates insulin levels for horses with metabolic syndrome. Helps prevent choke in horses. 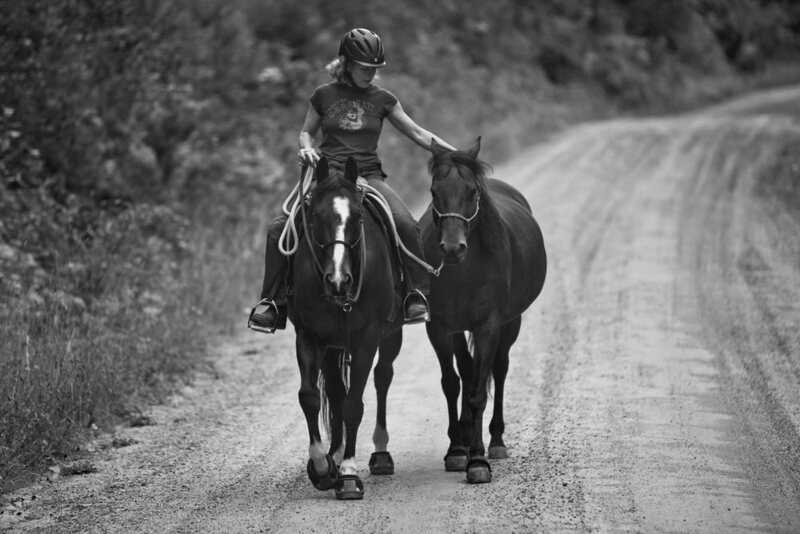 Your horse is ready to be ridden at any time, saving precious time before a show/event. Need to soak your hay to reduce sugar content? No problem, just fill and submerge. Our tie string comes in many colours, so each animal can have their own, (handy for barns or boarding facilities). Pazzaz with her Handy Hay Net. "Easy to load, way less mess, my big OTTB chooses to eat out of the net over the loose hay provided." "They last a long time, have outlived any other net I owned previously!" "Love our trailer nets! Best price I could find and the quality is great." "I'm already impressed! Fast shipping is very much appreciated 😀 Our last net-free round bale is almost gone and I'm looking forward to using the Handy Hay Net for the next one!" "Best hay bag I've ever owned, my horse has destroyed many but not this one!" "I have tried many brands of nets. My herd is made up of Fjords & I want them to have hay available 24/7, for the benefit of their health, but not cause founder from over-eating. Using the 1" hole nets with grass hay has proven marvellous!! I have the happiest horses! Handy Hay Nets are BY FAR the BEST hay net product, plus have the most sizes, colours etc to choose from AND are the best priced!" "A friend told me about these. I have used tons of slow feed hay nets. These by far are my favourite. They are easy to fill, easy to use and look easy to keep clean. I got the medium bag so I can fill them up and toss them in the pasture to keep my kids busy for the day."